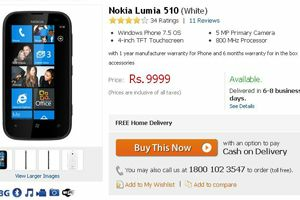 Nokia Lumia 510, the Windows Phone 7.5-powered smartphone which was unveiled last week in India, is now available in India at Rs 9,999. Online retailer Flipkart is currently selling the device and promising delivery within six to eight days of placing the order. The key selling points of Nokia Lumia 510 are its 4-inch touchscreen, 5MP camera and its sub-Rs 10,000 price tag. The phone runs on Microsoft's last generation Windows Phone 7.5 mobile operating system with Modern UI and Live Tiles and is powered by a 800MHz processor with 256MB RAM. Lumia 510 has internal storage of 4GB and Nokia has bundled 7GB of free cloud-based storage on Microsoft's SkyDrive with this device. For connectivity, the smartphone works on 2G, 3G and Wi-Fi networks, and comes with Bluetooth 2.1 and microUSB 2.0. The phone runs on a 1,300mAh battery that offers talk time of over 8 hours. Nokia Lumia 510, the cheapest Lumia phone till date, will compete against the likes of Sony Xperia tipo, Samsung Galaxy Ace and Motorola Defy Mini in the country.